Researchers at the University of Manchester have tied a trefoil knot around two different lanthanide ions: lutetium and europium. These organometallic complexes have left-handed chirality and can be used as asymmetric catalysts in aldol reactions. 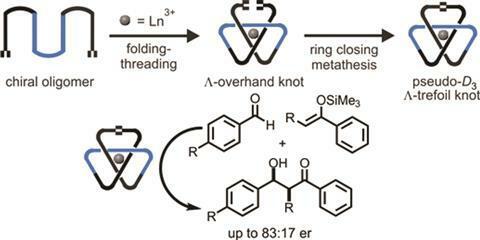 The team led by David Leigh modified an existing process to create racemic trefoils by using a new chiral ligand – a flexible pyridinedicarboxamide oligomer that twines around the metal forming an overhand knot. Chemists then used olefin metathesis to join the two ends together and obtain the final left-handed product. Following the reaction using NMR allowed them to see how symmetry increases once the knot is closed. 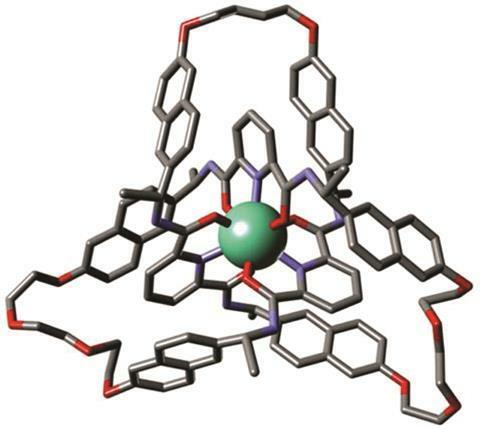 Although chiral molecular knots have been prepared before, this is the first time they have been used in asymmetric catalysis. Leigh’s team used the europium complex to promote Mukaiyama aldol reactions, obtaining higher enantiomeric ratios than comparable, unknotted ligands. The authors expect that this new strategy to lead to molecular knots that will aid research in fields like catalysis, liquid crystals or non-linear optics, where topological stereochemistry plays a central role.